FMIN Partners, Krishna Rao and Premajyothi Bathula in India, were able to minister to a neighboring village. The village of Mandapeta suffered a terrible fire. 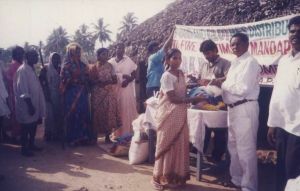 The Bathula's Evangelical Association Ministry and Faith Home were able to hand out rice and clothing to the victims as well as pray with them.